Have you ever been fighting the unspeakable horrors of the Old Gods in a dungeon or raid and quietly thought to yourself, “You know, it sure would be keen to fight on their side?” Well now you can — and you don’t have to be a Shadow Priest to do it. A new toy is hidden away in Tiragarde Sound that will do the trick, and give you a stunning visual to quest by while it’s activated — the Gem of Acquiescence. 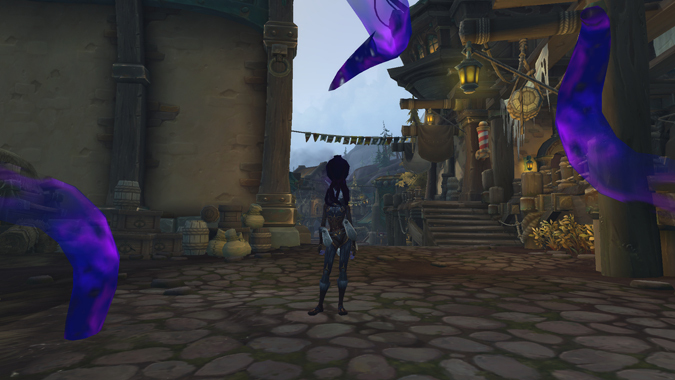 It’s not too difficult to pick up, but note that you’ll need to complete at least part of the introduction for Stormsong Valley in order to obtain the toy. 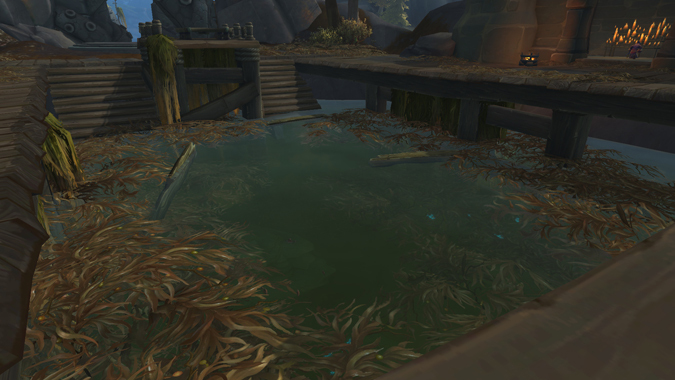 Essentially, you want to help out Taelia with some astute investigation, head to Stormsong, and follow dear old Brother Pike for a little while until you figure out just what the Tidesages are up to. Once you’ve seen the big reveal, you can head back to Stormsong Monastery in Boralus for a…delightful surprise. Warning, spoilers for Stormsong follow below. Stormsong Monastery has gone from suspicious behavior and wary eyes watching your every move to full-blown hostility. Be prepared to do a lot of fighting…or to stealth your little heart out if you’re a sneaky Druid or Rogue. You’ll want to head to the big pool behind the major building on the premises, where the Tidesages were once hard at work summoning…something. Ignore all that unsettling behavior and dive right into the pool. There’s a hidden cavern far below — don’t worry, you won’t drown before you get to it. In the cavern is an Ominious Altar with an interactive widget. Clicking it will open a dialogue box that asks “How will you begin?” Well…you don’t really know the answer to that just yet. I mean, you haven’t even enrolled at the Monastery, much less started any serious lessons. But if you look to your left, you’ll notice a skeleton on the ground with a scroll in its hand. Clicking on the scroll will give you the answer to the first question…but it turns out there are more questions where that came from. Luckily for you, there are also more scrolls. Slightly less lucky is the fact that most of these scrolls are being watched over by nearby K’thir Occultists, which you’ll have to deal with before you drink in all that tasty dark knowledge. The scrolls are scattered throughout the Stormsong Monastery. The second scroll is in a basement located at coordinates 60,78. The third scroll is on the second floor of the large building at the center of the Monastery, at coordinates 63,81. 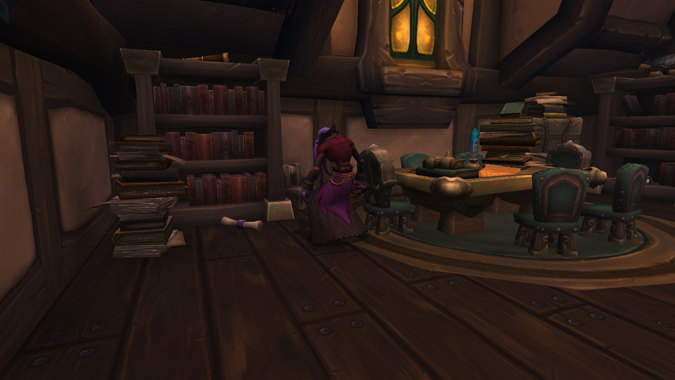 Mind the poor Tidesage Archivist mopping the first floor while you’re there. The fourth scroll is located in a basement on the opposite end of the Monastery from the first, at coordinates 71,84. The final scroll is located in the Archives at the center of the Monastery, in the little corner nook at coordinates 67,79. Once you’ve collected all the scrolls, you can return to the Ominous Altar and begin your lesson. Click through all the dialogue and you’ll eventually be asked if you’d like to continue. Are they mad? Of course you’d like to continue! Delight in the sea of void tentacles and the swift teleportation to the middle of the sea. There before you is the prize you’re seeking — the Gem of Acquiescence. Using the toy will envelop your head in the embrace of a tentacled horror — and your screen will be lovingly flanked with tentacles as well. The effect lasts for 30 minutes, and even persists through combat. The Gem, however, has a 60 minute cooldown…which means you’ll only be able to spend half your time dedicated to the service of the Old Gods. But half is better than nothing, right? Finding the Gem not only adds another Toy to your collection, it also nets you progress towards the Treasures of Tiragarde Sound achievement. Achievements, collections, new toys, and the cold embrace of the Void? Sounds like a good deal to me!